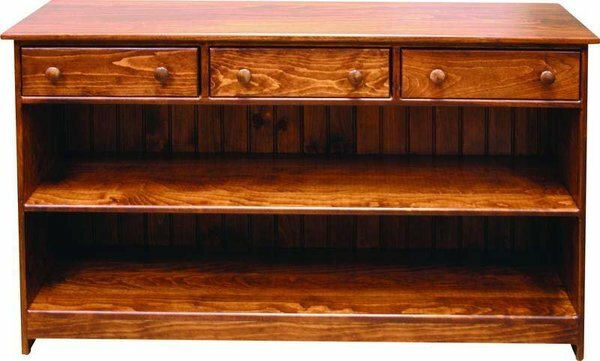 Looking for the right solid pine furniture to house your books, magazines, collectibles and more? You've found it with our Amish Pine 50" Hall Bookcase Console Table. Eliminate unsightly piles and stacks in the corner. This charming pine bookcase provides roomy shelves and three drawers to keep everything handy and organized. Just right for your hallway, foyer, den, office or living room, this Amish pine bookcase lends itself easily to your cottage style or shabby chic furniture collection. Choose to have it unfinished, painted, or select a two-tone finish. Three drawers provide ample space for keys, notepads, remotes and other items you need to retrieve quickly. The spacious pine shelves will hold a generous collection of your favorite novels or can easily keep your magazines or reference materials organized. This American made pine furniture offers a selection of hand-painted designs for you to consider. Personalize your pine bookshelves with the design you love most! Consider our Amish Log Furniture Rustic Coat Rack to pair with this pine bookcase console table.